Free Metro rides in snowstorms? Legislation is being filed this morning by King County Councilmember Jeanne Kohl-Welles that would allow for free Metro transit during snow emergencies. The measure comes in response to a massive storm that devastated roads and highways across the region earlier this year. Here’s the proposed legislation (PDF); we’re checking with our area’s King County Councilmember Joe McDermott to see what he thinks of the proposal.  Lots of construction activity including jackhammering, removing the east portion of the roadway, large trucks, machines, noise, dust, and vibrations.  We will coordinate with residents for driveway closures.  Typical weekday work hours from 7 AM – 5 PM. There will be some weekend and nighttime work.  We have heard that Seattle Public Utilities will be working to make some water service renewals along SW Avalon Way. They will coordinate directly with neighbors as their work is scheduled.  Buses are making in-lane stops. Please follow the safe passageways set up for your safety. Starting Monday, April 22nd the northbound stop at Genesee will be temporarily closed.  Sign up for Metro’s Rider Alerts to stay up to date on stop relocations. If a stop is relocated or a bus is detoured, signs will also be posted along the corridor.  30th Ave SW will be temporarily closed for construction staging. You will not be able to access SW Avalon Way from 30th Ave SW.
need to turn right into their driveways and will not be permitted to turn across traffic.  No Parking signs throughout zone B, and into zones A and C to facilitate the traffic shift.  Sidewalk and crosswalk detours. Please follow posted pedestrian detours when you see them. east side of SW Genesee St.
We need to work across multiple lanes of traffic in the intersection to do water utility repairs along SW Avalon Way. People driving west on SW Genesee St will not be able to access SW Avalon Way. One lane of traffic in each direction will be maintained on SW Avalon Way through the SW Genesee St intersection. We will maintain local access to driveways on SW Genesee St near the SW Avalon Way intersection. 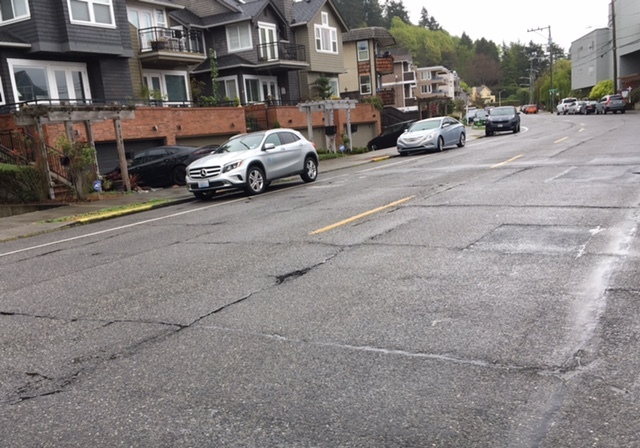 SDOT is also requesting: “If you have a driveway on SW Avalon Way between SW Genesee St and SW Yancy St, please reach out to us with your address and best contact information.” … AvalonPaving@seattle.gov is the contact address (also for anyone with questions/concerns). The newest “no parking” signs along part of Avalon, south/west of the Luna Park business district, are the first sign of what’s about to begin – SDOT‘s Avalon/35th/Alaska project. We’ve been following the planning process all along, but with work starting next week, it’s time for a closeup look at what you’ll see happening with SDOT’s biggest West Seattle project in a while, so we went downtown to SDOT offices in the Seattle Municipal Tower to talk with key members of the project team – Adonis Ducksworth and Bill Clark. As previously noted, the project area is broken into zones. As announced last week, work will begin in Zone B, along Avalon between Yancy and Genesee. Construction is scheduled to begin as soon as April 15 in Zone B – on SW Avalon Way from SW Genesee St to SW Yancy St. The decision to begin work in Zone B was made after SDOT consulted businesses along SW Avalon Way about what phasing would have the least impact on their summer schedules and business operations. 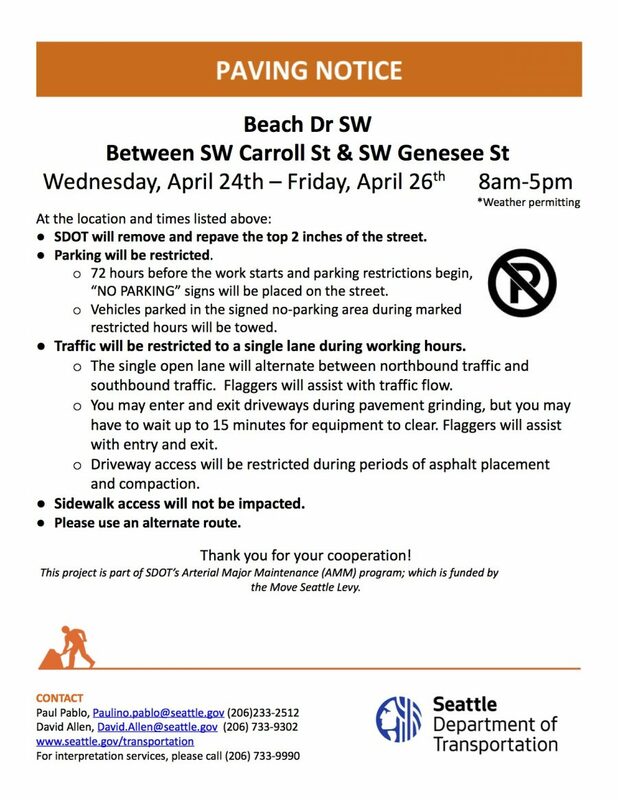 As soon as early May, construction is also anticipated to begin along 35th Ave SW between SW Alaska St and SW Avalon Way (Zone E). We will provide more information on what to expect as the schedule for this work is confirmed as well as the schedule for work in additional zones is confirmed. Businesses along the corridor can also reach out to the Seattle Office of Economic Development (OED) Small Business Development Program for assistance with construction impacts. Please reach out to AJ Cari, the OED’s Construction Impacts Advocate, at aj.cari@seattle.gov or at 206-684-0133 for additional help and information on how the OED can help you prepare for construction. It’s been two years since SDOT started ramping up the Avalon project. The other project the department was talking up back then, Roxbury repaving, has since been shelved indefinitely. 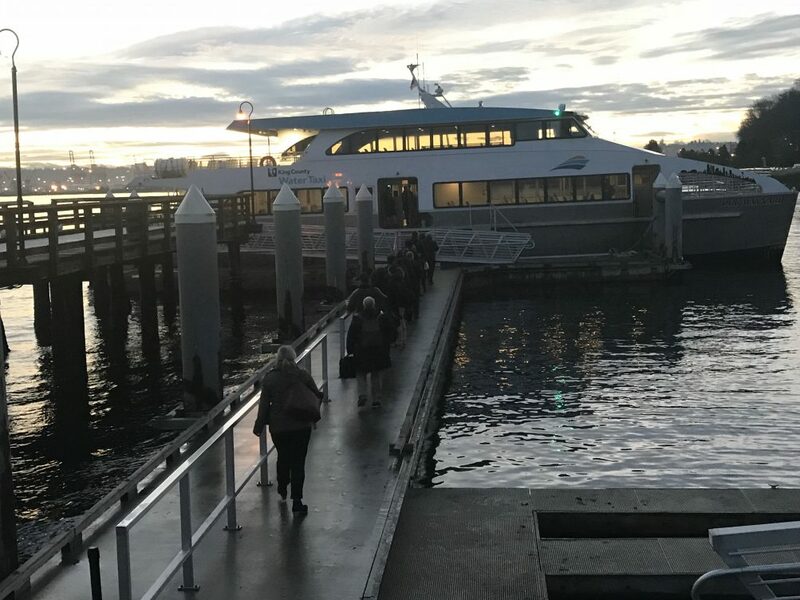 Washington State Ferries wants to be sure you know that the Fauntleroy-Vashon run is getting heavier traffic this afternoon because of a service outage on the south end of Vashon. The Tahlequah-Point Defiance run has been shut down since the M/V Chetzemoka went out of service with a generator problem. No ETA yet for its return. That’s in honor of the area being part of the in-progress West Seattle Neighborhood Greenway. And it’s why SDOT director Sam Zimbabwe was part of the dedication along with interim Parks Superintendent Christopher Williams and even Mayor Jenny Durkan. Until 4 pm, you can stop by and enjoy the festivities – including a chance to vote on paint patterns for part of the street adjacent to the play area. This play area improvement project relocates the existing play area to the south open lawn area providing ADA access and increased safety by making the play area more visible from the street. The new play area size increases from 1,280 sf to 5,260 sf and upgrades it to our standard size for a community center. The new play equipment features swings, slides and many climbable features. The park features a rolling hill with net climber, and an overhead climbing structure. In addition to the play elements the project incorporates two new seating areas, one adjacent to the play area and another in the location of the old play area. … The location of the old play area will be restored to an informal open lawn as requested by the community. Zimbabwe noted that this is one of six parks that the greenway will eventually connect to. Another number was cited by Williams: 94 percent of the city has a park within 10 minutes’ walking distance. The play area renovation cost $700,000.